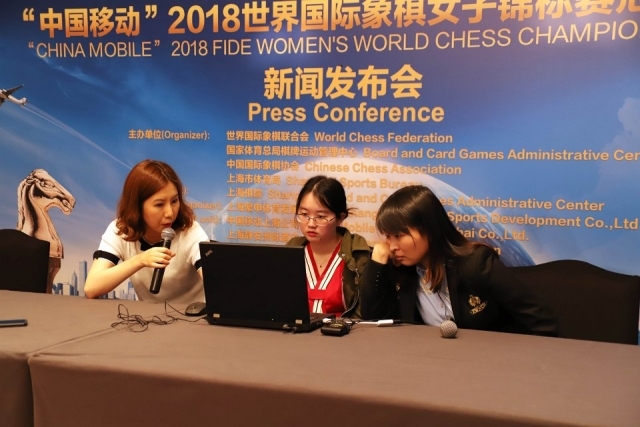 The fourth game of the FIDE Women’s World Chess Championship Match was held at the InterContinental Hotel Shanghai on the 7th May. After 2 losses the Women`s World Champion Tan Zhongyi defeated her opponent Ju Wenjun. The score in the Match is 2.5:1,5 and the challenger still leads after 4 rounds. Playing with White pieces Tan Zhongyi started with Trompowsky Attack. She was trying to avoid theoretical lines and choose to fight in the middlegame. White was obviously looking for attacking chances on the King`s side but it seemed Black had enough forces for defence. After 21.g4 the position became sharp and according to Tan Zhongyi, she did not believe she had any advantage until Ju Wenjun made a few inaccurate moves. It seems Black got into trouble after exchanging a very strong knight (23...Nxd2) and after another mistake 26...g5 White had just to find precise moves to finish her attack. The 8th of May will be the second rest day in this match. According to the match regulations, players will switch colours after 4 games and it means Tan Zhongyi will have white pieces on the 5th round.